Looe in Cornwall is a quintessential Cornish fishing port and seaside holiday town. It sits on grid reference SX254533 at the mouth of the Looe estuary and is as picturesque as any town in Cornwall. Both East and West Looe flank the Looe river estuary which has its source up on Bodmin Moor and opens out into Looe bay. The river dissects the landscape in and around Looe into deep wooded valleys, grassy hillsides and quiet stream filled gullies. Large tracts of ancient woodland remain on the river banks as you journey upstream and there are superb walks to be had in Kilminorth Woods which can be found at the end of the Millpool car park. East Looe is blessed with a fine, golden, sandy beach and is in sharp contrast to West Looe which has a rocky shoreline (Hannafore beach). Coastal features are high cliffs interspersed with sandy bays, many of which are easily accessible by visitors via the South West Coastal Path. To the west of Looe are other pretty coastal villages, Polperro being one of note. Slightly further west is the larger town and harbour of Fowey, with its wide estuary and river. Travel east from Looe and you will soon come to the naval city of Plymouth in Devon. Looe (Cornish: Logh) as a settlement, has been dated back to as early as 1,000BC. The Giant’s Hedge and Bin Down stone circle (an ancient hill fort) discovered overlooking East Looe, indicates this. After his successful defeat of King Harold, William the Conqueror, at the time of the Domesday Book, held the manor of Pendrym. East Looe was included in Pendrym and later became managed by the Bodgrugan family. The area of Shutta, East Looe, which still exists today, has records of inhabitance that can be traced back to the 12th century. Sir Henry Bodrugan received a charter from Henry II for East Looe during this century while West Looe became a free borough. East Looe along with other ‘new towns’ such as Winchelsea in East Sussex, were called planted boroughs. These towns grew around a grid like pattern, much like cities in the USA are planned today. Looe Island, situated off the coast of West Looe, became home to a monastic order (before 1144) who constructed a chapel and used beacons as a rudimentary lighthouse. Sadly ruins only remain. The first bridge to connect East and West Looe, was wooden and was finished by 1411. A stone bridge replaced it in 1436, while the present seven arch Victorian bridge was completed in 1853. By the 1850s, Looe was a major port exporting granite, tin and arsenic. Boat building and fishing also thrived. Looe had a large trade in pilchards, warranting its own cannery, while railways were built to service the growing mining industries. These, like most railways, suffered as the mining boom ended but the Looe to Liskeard line began carrying passengers in 1879. A lifeboat station was established in East Looe in 1866. Like the ocean, over the following centuries Looe’s prosperity ebbed and flowed but even today, it is still a thriving fishing port with a successful tourist industry. If you want to find out more about the history of Looe it’s worth popping into the Looe Museum. For a small Cornish seaside town, Looe certainly has something to shout about. After London and Edinburgh, Looe is the best place in the UK to celebrate New Year, with its eardrum bursting fireworks and friendly atmosphere. As a tourist destination, Looe is second to none. During the summer months the town is packed with families enjoying the delights of East Looe beach and the cobbled back streets in the centre of town. The harbour is awash with colourful boats and the fish market is always busy. With accommodation to suit all tastes, group sizes and pockets, Looe is a year round destination. In fact Looe is so popular I created this website and a phone App, the iLoveLooe App. How many British towns can boast that? Instantly recognisable with its distinctive Banjo Pier (constructed by Joseph Thomas), East Looe has a wide, crescent shaped, sandy beach and a unique town centre packed with cafés, pubs, shops and restaurants. East Looe is also home to the lifeboat station, Old Guildhall (museum), railway station for the scenic Looe Valley Line, primary and secondary schools, a children’s centre and a multitude of holiday accommodation. Narrow winding roads take you up through Looe’s historic Shutta district and beyond that, to the estates of Sunrising and Barbican. East Looe used to be famous for its display of sharks, caught by local boats, that were hung, ready to be weighed on the quayside. Today, they have protected status and shark fishing is catch and release only. 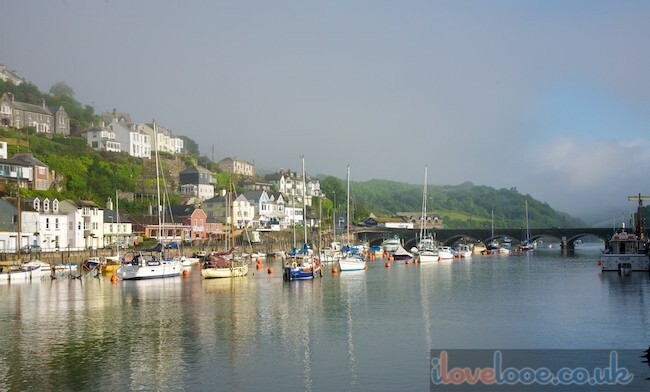 In contrast to East Looe, West Looe is quieter and retains a quaint and peaceful charm. Centuries old cottages wind their way up the steep high street, enabling you to spot those that were smuggler friendly. Just look for the unique ‘Devil on Horseback’ ridge tiles on the end of their roof lines. West Looe is also home to the Jolly Sailor Inn, the oldest pub in Looe. Since 1516, the ‘Jolly’, has offered board and lodging to sailors and travellers. With fewer shops and restaurants than East Looe, West Looe is more residential with many homes offering boutique style B&B and hotel accommodation. For families, the West Looe Playgroup offers a service for youngsters, while the rocky shore at Hannafore makes a great place to explore. Hannafore is said to have the best views in all of Looe and depending on where you stand, you can be looking directly out to sea or up river and over the harbour and roof tops of East Looe. The coastline along Hannafore has unrivalled views of St George’s Island, known locally as Looe Island and is a lovely place to sit, relax and enjoy the views. At very low tides it’s possible to reach the island on foot – just leave enough time to get back! I can’t guarantee you won’t get for feet wet either but it’s a great experience to cross to the island without a boat. Although Hannafore is mostly residential, there are tennis courts, putting and bowling greens and being directly on the South West Coastal Path, a good selection of places to stay for walkers and holiday makers alike. Being a premier tourist destination in Cornwall, both East and West Looe offer visitors an array of different types of accommodation. From single business people to wedding parties and fishing groups, Looe can accommodate them all. 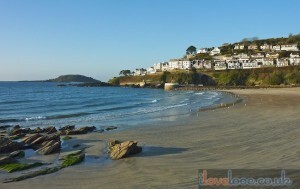 Looe has plethora of B&Bs, hotels, self-catering, inns and taverns. If you’re after a quiet rural retreat, the surrounding villages offer delightful farmhouses, camping sites and holiday parks. There is something for everyone. Being one of Cornwall’s top tourist destinations, there is no shortage of shops offering quality reminders of your stay in Looe. You can pick up unique and unusual gifts, be they consumable or longer lasting, from many of the shops in town. If you love staying on the beach all day, there is no shortage of rubber rings, buckets and spades, sun hats and everything else you might need for a day relaxing by the sea. You will be surrounded with choices all the way through the town so shop around to find the best offers. Although geared up for tourism Looe also has all the shopping amenities of other larger towns. Banks, estate agents, post offices, supermarkets, chemists, jewellers, Looe has them all. For foodies, Looe’s delis’ offer delicious Cornish foods, pickles and jams and if you love pasties, pop along to any of the specialist Cornish Pasty bakeries in East Looe. Each bakery has it’s own style and everyone has their favourite so don’t be afraid to try a few to find yours. If there’s one things Looe can guarantee you it’s that you will never go hungry. From burger bars to awarding winning fish restaurants, East and West Looe can satisfy any palate. Many of the pubs and cafés serve wholesome and hearty lunches, while for that special evening out, restaurants offer delicious a la carte menus prepared by award winning chefs. Of course, this being Looe, the locally caught fish is always recommended. If you like your coffee with a bit of atmosphere, then I recommend Larsson’s Coffee House in Buller Street, East Looe. This licensed Coffee House and Crêperie (you must try the crêpes) offers a great ambiance, great coffee, fine food, music evenings and even its own dining club! No visit to Cornwall is complete without sampling a Cornish cream tea. They’re an essential holiday treat that everyone can afford and you can enjoy yours in any of the cafés in town. They’re a great Cornish tradition. The music event of the year in Cornwall. The 2011 Looe Music Festival hosted bands such as: Eclypse, Dalla, Mercury Moon, Pentorr, Catseye Morris, Kirsti Robinson and Oscar Rodrigez. Comedy star Adrian Edmonson (The Young Ones, Bottom) sang with the Bad Shepherds, while The Selector and Roy Wood, also gave great performances as headline acts. The Stranglers, Levellers and The Skints are all headlining the 2012 Looe Music Festival which promises to be an fabulous sell out. For full details of dates, times, prices and full line up, check out my Looe Music Festival posts in the Looe News blog. This annual event takes place in the centre of Looe and includes Grazing by the Quay, Looe Raft Race and RNLI weekend. A weekend of fun on the water, eating freshly caught seafood and other local produce. Showcasing the best of Cornwall’s food and drink producers and their products, there will be cooking and preparation demonstrations, tastings and the chance to purchase delicious local produce. The event will be held in the Millpool car park over a weekend in June. iLoveLooe will have all the latest details when available. One of West Looe’s great traditions. May pole dancing, various stalls, singing groups and all the fun of the fayre! A great weekend for all. Hosted by The Liskeard Steam & Vintage Club Ltd, The Bocconoc Steam Fair held at Boconnoc Estate, a few miles from the town of Looe, is one of Cornwall’s best steam rallies. There are also classic cars, vintage tractors and a local crafts marque for that special gift. Originally called the Port Eliot Lit Fest and held at St Germans near Looe, the festival celebrates everything wonderful about music, words, imagination and fun. Visitors come to see and hear writers, poets, journalists, artists and musicians performing their unique talents. From humble beginnings (17 people paid to get in) the weekend festival is now supported by thousands and fun for all the family. Just a short drive or a few miles of coastal walk from West Looe, lies the wonderful and picturesque village of Polperro. The Polperro Festival hosts local musicians and bands and various other events such as comedy night, Morris dancing, bingo, food and drink and much, much more. It’s well worth a visit if you like small festivals. 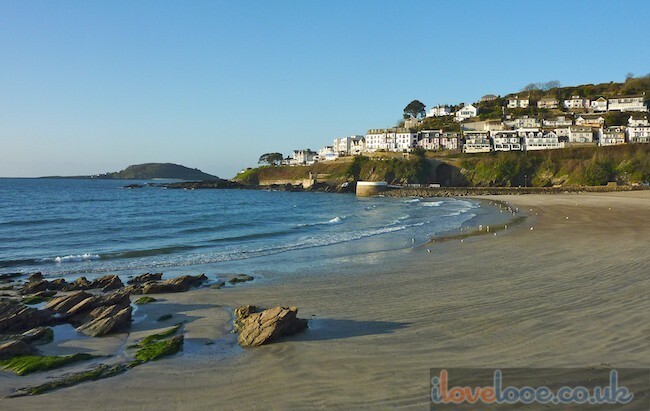 Beaches – Looe’s beautiful golden beach is a draw for families and couples but its only one of Looe’s attractions. Here’s just some of the things Looe has to offer everyone. A great Looe pastime for locals and visitors alike. On a sunny evening you’ll find the quayside covered in people and a forest of lines dangling in the clear, blue water. Please return your catch as the crabs are not edible! There are plenty of boats in Looe harbour offering sea fishing trips from a morning to a full day’s sport. If you prefer to observe and explore, these popular boats take you on a Jacques Cousteau experience around the Looe coastline. For a relaxing evening, Looe’s own cinema club shows a selection of art house and contemporary films throughout the year. Find out more here. Best saved for one of those rare rainy days, Looe’s museum is full of artifacts detailing the history of the area, smuggling, fishing and much more. The countryside around Looe is a walker’s paradise. Rolling green hills, lush farmland, coastal views to die for and of course, the South West Coast Path, which winds its way through East and West Looe. This 630 mile coast path stretches from Minehead in Somerset to Poole Harbour, Dorset. A truly breathtaking challenge. There are many rivers and lakes in Cornwall offering fishing, but please remember that most are private, so a day ticket will be necessary. One great spot is Bake Lakes which is only a few miles from Looe. Set in 30 acres with 9 lakes and ponds, Bake Lakes offers fly and coarse fishing. Although the line only runs 8.75 miles from Looe to Liskeard, it follows the very pretty East Looe river valley and provides a great day out for visitors. Whitsand Bay – four miles long, this beach produces some big waves loved by surfers. Unfortunately, it rains even in Cornwall. But that doesn’t stop the exploring and adventure. Only a few miles drive from Looe you will find many stately homes and country houses with plenty to offer. Lanhydrock, Bodmin – Overlooking the Fowey river, this 890 acre estate has been owned by the National Trust since 1953. As well as beautiful grounds to explore, Lanhydrock House is a gem. Cotehele, Saltash – A delightful Tudor House filled with tapestries and furniture, plus lovely gardens and orchards to relax in. Antony House, Torpoint – with 25 acres of glorious gardens and park with Japanese gardens, ponds and terraces, the house has fine oak panelling while the outside remains virtually untouched. Restormel Castle, Lostwithiel – this 13th century castle has seen a lot of unrest in its day, finally being left to ruin in 1664 after the Royalists re-took the castle during the English Civil War. For animal and plant lovers, there is plenty to do within easy reach of Looe. Tamar Valley Donkey Park, Gunnislake – open from April to September, you can feed the donkeys, pigs, goats, sheep, rabbits and guinea pigs. You can give the animals a hug too. The Monkey Sanctuary, St Martin – established in 1964 by Leonard Williams (deceased), the Monkey Sanctuary offers a safe haven for four types of monkey: Barbary Macaques, Woolly monkeys, Patas and Capuchin monkeys. There are 24 residents in all, most of which have been liberated from the worldwide pet trade or zoos or bred here. Eden Project, St Austell – constructed in a redundant kaolinite (mineral clay) mining pit, the Eden Project is one of the new wonders of the world. Housing the world’s largest greenhouse, the project is the brainchild of Tim Smit, who also designed the Lost Gardens of Heligan, and opened in 2001 after more than two years of construction. Consisting of three main biomes – Mediterranean, Outdoor and Rainforest – each biome houses plants particular to that habitat. The Mediterranean biome caters for tropical plants such as rubber and coffee, while the Rainforest biome houses arid plants including olives and vines. Lastly, the Outdoor biome is home to teas, lavenders and hops. This biome is not covered. Carnglaze Caverns, Liskeard – people visiting Carnglaze Caverns find it had to believe that the three huge caverns were actually dug out by hand. A trip inside this disused slate quarry will take you 150m into the hill and 60m downwards. There are 60 steps to help and at the bottom, you will find a beautiful turquoise lake. Suitable clothing and footwear recommended as the temperature is 10°C all year round. Cornwall has to be one of the prettiest counties in England. Whilst exploring, these are just a few of the villages and towns that should be on anyone’s ‘to do’ list. Polperro – sitting on the South West Coast Path, 4 miles (6.4km) west of Looe, Polperro (Cornish: Porthpyra) lays claim to being one of the prettiest villages in Cornwall. With its narrow, car less streets, whitewashed fishmen’s cottages and attractive harbour, Polperro is extremely popular and in the 1970s received up to 25,000 visitors a day in high season! Tourism, now the main industry, replaces a centuries old fishing trade centred around the pilchard. Caught and processed by Polperro fishermen, these humble fish were exported all over Europe. Today, Polperro is a great starting point for one of the many walks around the village or visiting a sandy beach or two. Why not take a boat trip to look for dolphins and seals or simply enjoy the ambiance of village life via the pubs and restaurants. Polperro is a village you will want to return to or own a cottage! Please note: parking is outside of the village with a half mile walk to the centre. There is transport if required. Callington – if you like pasties you’ll love Callington. Gingsters, the bakers, has its headquarters here. Callington (Cornish: Kelliwik), rose to prominence as one of Great Britain’s significant mining districts but this has come to an end. If you visit during October, on the 1st Wednesday the Honey Fair is held. The village is taken over by an array of exhibitors, traders and entertainers. It is a great event with a fun fair and you can even buy some honey! Other popular visits are St Mary’s Church (15th C) which has interesting tombs and Pannier Market is worth exploring. A unique enterprise is the Callington Mural project. Artists have decorated many buildings with an array of delightful murals. There is a surprise at every turn. To walk off lunch, Kit Hill is worth the effort for views over Bodmin Moor and in June there is the Kit Hill Run while July hosts The Carnival when the town will be in full bloom. Fowey – this attractive and charming riverside town is one of Cornwall’s most popular tourists spots. Fowey (Cornish: Fowydh) is pronounced foy and is sited on the west bank of the Fowey river. The town is steeped in maritime history notably Sir Walter Raleigh and Sir Francis Drake who both sailed from here. Fowey is still a working port with china clay a major export, while fishing and private boats fill the harbour. The town itself is a delight with hidden twittens, cobbled streets and pretty cottages with plenty of opportunities for dining and shopping. One well remembered resident is Daphne du Maurier, author of novels The Loving Spirit and The Glass Blowers, who lived in the town for several years and loved Fowey. For the active, between Easter and September there are weekly guided walks around the town and being on the South Coast Path, plenty of opportunities for countryside walks. The harbour offers boat trips and sailing lessons. Near to the town there are good beaches at Readymoney Cove, Polridmouth Cove and Whitehouse. Bodmin – (Cornish: Bosvenegh) is situated south-west of the granite Bodmin Moor and one of Cornwall’s oldest towns. Over the centuries Bodmin has been the at the heart of three uprisings by the Cornish – all failed. While in the 14th century the black death wiped out approximately 1,500 residents. Things are a lot quieter now, even the town jail is a museum with its own bar. Whatever next! Other attractions include: St Petroc’s church, Courtroom Experience, Camel Trail (bring your own camel), Bodmin’s Well Trail and Town Museum. If you fancy some fresh air, the Bodmin Beacon Local Nature Reserve has 87 acres to explore or why not be transported back to the 1950s and take a trip on the Bodmin and Wenford railway. Saltash – known locally as the ‘gateway to Cornwall’, Saltash (Cornish: Essa) sits on the Tamar river and is home to Isambard Kingdom Brunel’s Royal Albert Bridge. Established as a market town in the 12th century, Saltash (meaning: ash tree by the salt mill) is now a large town and hosts many festivals throughout the year, the summer Town Regatta being a prominent one. Kingsand and Cawsand are two villages nearby worth visiting and Saltash is a great place to visit the Tamar Valley (AONB) from. Being a major town, Saltash offers a leisure centre, rowing clubs, a BMX and skatepark and even a tennis centre. Other attractions include the museum, Heritage Trail, art trail and river cruises. Golitha Falls – a popular beauty spot in the south of Bodmin Moor, the falls are in a reserve of woodland and steep valley gorge, through which the Fowey river flows. A haven for wildlife enthusiasts, you can expect to see numerous bats (noctule, lesser horseshoe), birds (buzzard, dipper), moths (small skipper, speckled wood) and plant species (self heal, white clover) to name just a few. The site has parking and a camping and caravan park is 1 km away. The falls can be found 5 km north west of Liskeard. Lostwithiel – known as Cornwall’s hidden treasure, Lostwithiel is a great base to explore the countryside and the delights of Cornwall. Lostwithiel is full of shops, restaurants, pubs and hosts many festivals celebrating every from music, arts and antiques to food and beer. From Looe it’s easy to find. At Liskeard join the A390 which passes through the town. Charlestown – west of Looe, this small fishing village started off as West Polmear with fishing boats landing on the shore. Over the centuries a harbour was built and the village grew as copper and china clay export businesses brought prosperity. Today, the harbour is owned by Square Sail, who own and sail a small fleet of tall ships. Some of these ships can often be seen in the harbour and are available for summer tours. Charlestown harbour has also found fame as a film location, with Dr Who, Poldark and The Three Musketeers, being a few productions partly filmed here. Now a popular tourist destination, Charlestown is a interesting place to visit. Polruan – situated on the Fowey river, Polruan is west from Looe, on the opposite side of the estuary to the town of Fowey. Still an active shipbuilding town, during the 19th century Polruan launched over 6,000 tonnes of shipping. This ancient, historic town has seen many a battle, so during the 14th century two blockhouses were built on either side of the estuary. A chain was suspended from the two stopping ships entering or leaving the harbour. Polruan’s blockhouse still stands today as a ruin but Fowey’s has disappeared altogether. Overlooking Polruan is the ruin of St Saviours which dates back to the 8th century and if you explore the town, many of the buildings have a historic story to tell. Polruan today is a lovely, unspoilt tourist town, loved by artists, musicians and everybody else who visits. To experience the delights of Looe without the hustle and bustle, then October to April is the best time. Although the weather is less predictable, Looe’s streets are a joy to wander around and the pubs and restaurants are less crowded. During May to September, Looe is buzzing with visitors. Car parks are full, accommodation is scarce and the eateries are packed. The atmosphere in Looe is fantastic as families and groups enjoy the summer sun but book well in advance to avoid disappointment. New Year in Looe is spectacular. 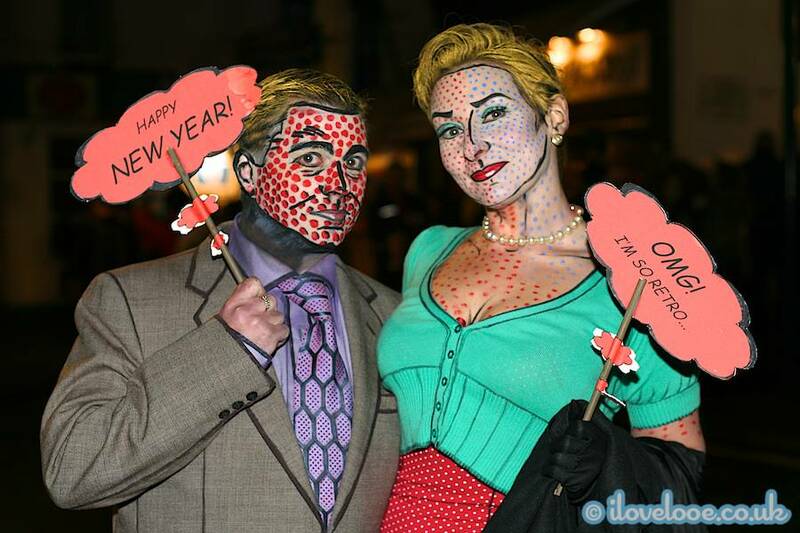 The fireworks are a work of art and people attend from all over the world. The evening is one of friendliness and revelry but book early if you wish to stay. Depending on direction of travel, come off the A303 or M5 at Exeter then join the A38 westbound towards Plymouth. Take the Tamar Bridge at Saltash, through the Saltash Tunnel to the roundabout (Note: Tamar Bridge is free into Cornwall. There’s a £1 toll on return). Still on the A38, pass through Landrake and Tideford and at Trerulefoot roundabout, join the A374 (1st exit) towards Looe and Torpoint. After a short distance turn right onto the A387 to Looe. Pass through the village of Hessenford, where the road becomes the B3253. Follow this into Looe. The national rail network can connect you to Liskeard with services running from main cities and towns such as London, Plymouth, Exeter, Bristol and further afield. At Liskeard, you join the Looe Valley Railway Line which takes you the 8 miles to Looe. This scenic journey takes in the glorious Looe Valley and Looe River, especially scenic at high tide. From all over the UK, National Express run regular bus services to Liskeard and Plymouth. From these points, local bus services will take you into the heart of Looe. This must be the most romantic way to visit Looe, unless of course, you’re on a fishing boat. The deep, wide harbour can accommodate most pleasure craft but contact the harbour master first, to check for available berths. Harbour Commissioners: 01503 262839. Due to its popularity, Looe’s car parks are often full. The Quayside, East Looe is the most convenient but fills the quickest. The Millpool over the bridge in West Looe is the largest and is probably the best one to aim for. There is a small car park between surgery and filling station on the A378 and the quayside in West Looe offers a small number of spaces. For road parking, Hannafore, West Looe is the best place. All car parks are fee payable, 24 hours a day. 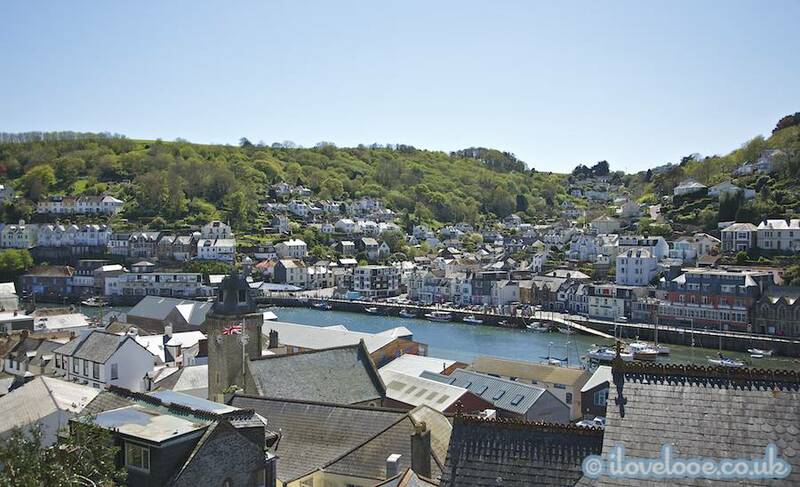 Looe is a Cornish town that puts the Great back into Great Britain. Put it this way, if you’ve never been, perhaps you should. If you have children and like the beach, fresh air, walks in the country, stunning views, good food and loads of things to do then you definitely should. Let me know if you do and enjoy your stay too. 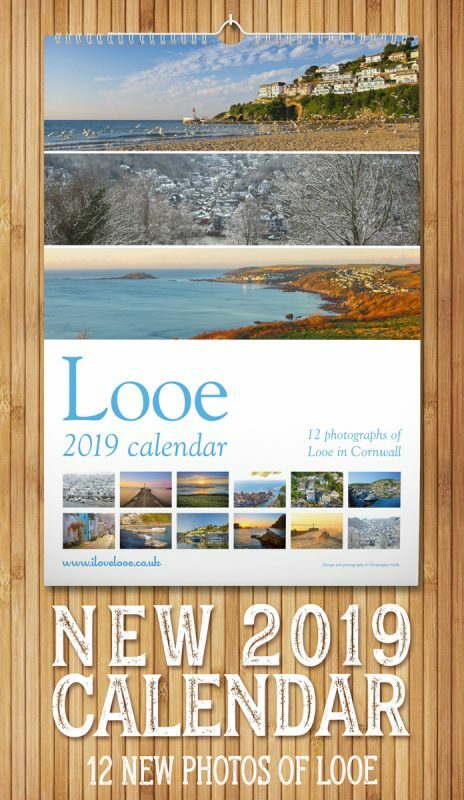 Love Looe? Like this on Facebook or Share it on Twitter.